Submitted by steev on 2. December 2005 - 10:51. After he ordered the military to use force to crack down on street protests in October 2003, causing many deaths, then-president of Bolivia Gonzalez Sanchez de Lozada fled the country with his cronies and has been comfortably ensconced in Miami ever since. Human rights organizations and the Bolivian government have been trying to get him extradited to give testimony and possibly be tried, but the U.S. is not cooperating so far. Now there's an online petition you can sign, asking the U.S. to serve the subpoena. Submitted by steev on 1. December 2005 - 9:42. Submitted by steev on 30. November 2005 - 11:52. My friend José, one of the smartest and most careful-thinking people I know, has written something in his blog with a very good point about the war in Iraq, and the ethical responsibility of our nation. I realize it will not be extremely popular amongst a lot of activists I know, but I confess I have said and thought similiar things in the past. 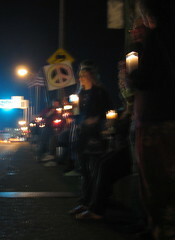 I remember the night of the September 25 anti-war vigil in Portland, on the Morrison bridge with my candle, a reporter from KBOO with a microphone and a minidisc recorder was interviewing people and she asked me what I thought should happen in Iraq with the troops. I expect that most of the folks she asked on that bridge that night said "bring em all home now," but I said, basically, that things aren't ever black or white, they're always grey, and it's complicated. it would probably be really disasterous to pull all of our forces out immediately, and yet obviously we're screwing stuff up there, so there has to be a middle path, where we start extricating ourselves, but in a responsbile way. It's a really hard problem; all the important problems usually are. Submitted by steev on 27. November 2005 - 15:17. The LA Weekly brings us an interesting, though unsurprising, story on how the border thing is becoming a big deal to Republicans. "Just Keep the President Home"
Submitted by steev on 26. November 2005 - 16:38.
he [Bush] recently learned that he is unpopular among some Latin Americans. 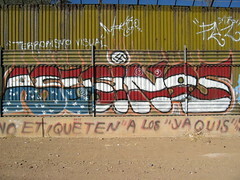 Violent protests greeted him this month at a meeting of Western Hemisphere presidents in Mar del Plata, Argentina. But neither he, nor we, should lose any sleep over this. It was the product of the unholy triumvirate of Venezuelan President Hugo Chavez, Argentine President Nestor Kirchner and over-the-hill soccer star Diego Maradona. The three of them are the personification of the most common failing of Latin American nations: perpetual adolescence. I'll be condescending back, Shirley, and say, I should have expected this kind of think from Kansas. Submitted by steev on 25. November 2005 - 9:07. An really great article in the LA Weekly about all that goes into bringing a Ceasar salad to your plate encompasses a plethora of social problems of today: genetic engineering, labor, immigration, health, pesticide pollution of the environment, gentrification, urban sprawl... It's all there. Submitted by steev on 24. November 2005 - 7:32. A study reports that chronic exposure to noise increases the chance of heart attacks. Oddly enough the average noise level of a typical busy large office, 60db, is about the threshold that researchers have found for an increased risk of heart attack. Even more oddly, they've found that noise in the workplace doesn't effect women. This doesn't seem right. Why would the type of noise matter? whether it's a jet plane or xerox machine, noise is noise. and why would it matter between the sexes? I hate these kind of articles where they just present these weird findings without even a theory for the reasons. In Harper's magazine on the back page it's funny, but in general I want more sense made from the datasmog being pumped at me. You'll Wish This Was Parody. Submitted by steev on 23. November 2005 - 18:55. A right-wing song called "Bush Was Right", by a band called "The Right Brothers," is out and wow, it is BAD. MSNBC has made a silly video (making fun of it) to go with it. Submitted by steev on 23. November 2005 - 16:32. Submitted by steev on 23. November 2005 - 9:34. The Blogosphere, or the little corner of it that I regularly monitor (read: that I subscribe to in my feedreader), seems to be slowing down, probably for Thanxgiving.